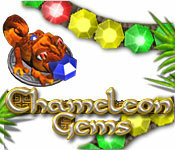 Chameleon Gems is rated 3.0 out of 5 by 2. Rated 3 out of 5 by mrm2006 from Not even worth the demo time. This is a typical "toss the marble from the shooter" game. Never sure what to call these types of games - lol. The graphics are good, although I had trouble with the moving conveyor of colored gems getting bigger, then smaller, then bigger and so on. SIGH! Can't comment on music and sound fx as I had the mute on. There is no tutorial that I could see and this game definitely needs a tutorial. Whether written or during the game play - it would have been a great feature. 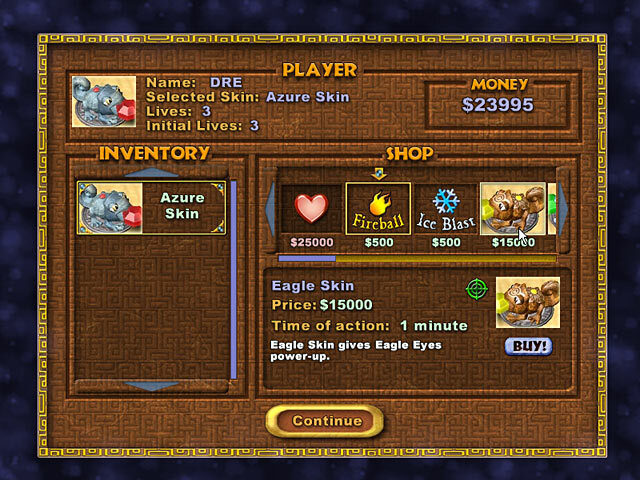 Also, the "bonuses", if any were available otherwise, seemed to cost an awful lot of "money" you earn during the game. But what you earn and when confounds me! And, as far as I could tell, you could only use the bonuses you bought ...... once. I was truly disappointed in this game. IMO it was boring, very un-entertaining and I couldn't find a single thing that would have me going back for more. So, NOT for beginners and I think those who enjoy this game genre will be totally disappointed. But, try the hour demo and ..... ENJOY! Rated 3 out of 5 by SynthpopAddict from Marble popper hiding out in the puzzle section Pros: unique stacked chains, able to buy extra lives Cons: short tracks, limited powerups Why this game is currently listed with the puzzles and not the marble poppers is a mystery to me. Maybe it's because the hero of this game is a chameleon and everyone knows they have many guises. Anyway, Chameleon Gems is a near copy of Zuma in the game action, but the chain is partially stacked instead of just a long spread out single string. The "marbles" are gems in this case, and they come in three sizes. The smaller gems sit on top of larger ones with only the largest size riding along the track and available to shoot. Removing the large gem from a stack by shooting out a group of 3 like colors causes the next larger one in the stack to grow and become available to shoot at. A set number of gems must be removed to fill a progress meter. 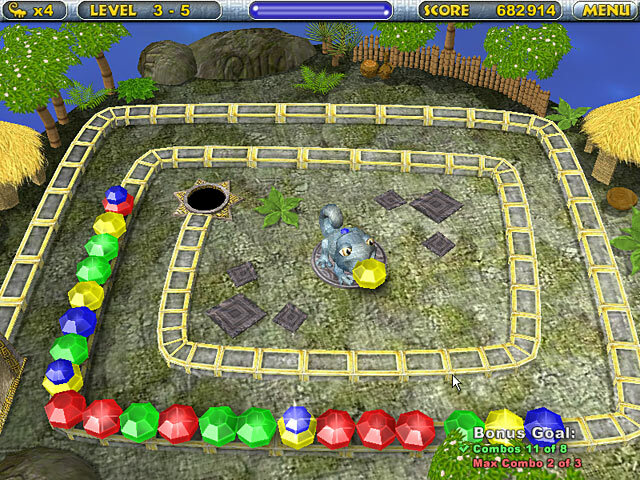 Once the meter is full no more new gems emerge and the remaining gems need to cleared before they reach the hole at the end of the track. Each level also features one or more "bonus goals" such as making a number of shots through a break in the chain or number of gem removals in a row to earn a higher rank and/or extra points. In between levels opportunities to buy additional lives and powerups are available. As in other marble poppers, powerups will also periodically appear during game play, and these are often more useful than the powerups to buy. Your character may be a chameleon, but he apparently flunked out of Color Changing 101 because he can only wear one "skin" (bonus powerup) at a time. The graphics are pretty simplistic, even for an older game. 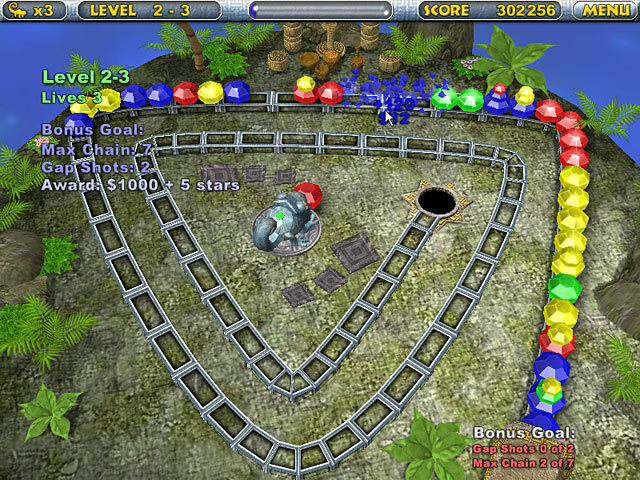 Players may also find the length of the tracks to be a bit short which can get frustrating on higher levels. It's an OK marble popper, but maybe that's why it's hiding out somewhere else.